The arts run deep in my family. Growing up, I thought it was really cool that my grandfather was an artist. I earned an Art & Art History major in college before becoming an architect and eventually a photographer. Within a few generations we have a concert pianist, an interior designer, a jewelry designer, painters, writers, architects, actors and a photographer. I've always felt most alive with a creative tool in my hand -- a pencil, a camera, even a computer (to write or design) or a paintbrush. Creative spaces of all kinds excite me -- museums, galleries, theaters, libraries and studios. Artists and creators are my muses, my subjects and forever my inspiration. I mention all of this because several people asked both Valerie and I why we were doing this project. And the answer is quite simple: it was born in this space -- this love of creativity. We just decided to make art. Art for Art's Sake. 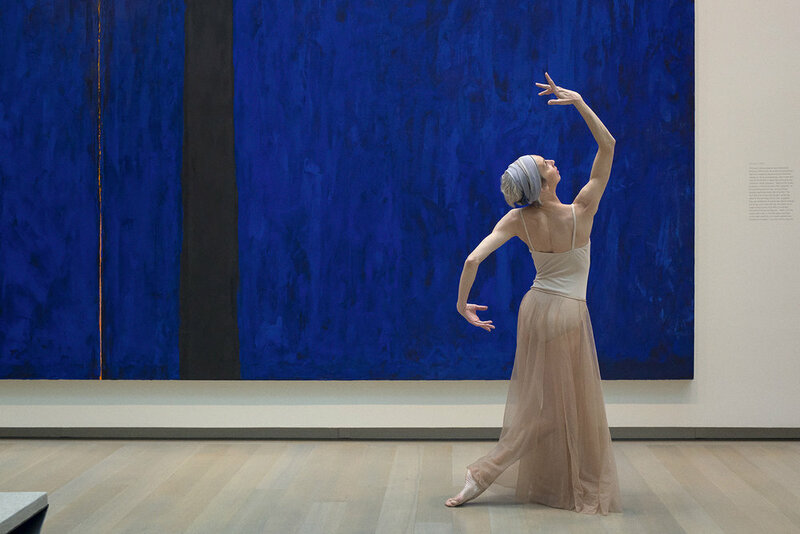 And I mean really: Art combined with dance and photography… it sounds like a dreamy mix, doesn't it? My creative collaborator -- my "partner in art" -- for this project is my treasured friend Valerie Madonia, an accomplished dancer in the world of ballet (seriously accomplished -- check out her bio below). I have known Valerie since our days of living in Telluride and have wanted to photograph her for years. When I first approached her I only knew that I wanted to photograph her, but the details were still murky in my head. I wanted to create striking images that involved her dance background and her graceful presence as an accomplished, poised and beautiful woman. Enter the Clyfford Still Museum. My background as an architect made me quick to fall in love with this unique space when it first opened in Denver. Huge abstract artworks on display in a building designed specifically to show this artist's paintings. The museum is impeccably detailed with beautiful proportions, overlapping spaces, strong architectural materials in natural earth tones, and architecturally designed to take advantage of Colorado's consistent natural light to illuminate the artwork. When I learned we could photograph inside the museum (with special permits), I suspected I’d finally found the location for our first shoot. Valerie and I toured on one of her visits to Denver. We set it up with proper permits and got to work planning our photoshoot, still not altogether clear on an end goal -- other than to make art for the fun of it. BEFORE I CONTINUE... A FEW WORDS ON ABSTRACT EXPRESSIONISM: If you're not familiar with the roots of abstract art, this genre of art is non-representational. Expand the photos below (from inside the Clyfford Still Museum) to see the evolution from more representational art to abstraction in both Clyfford Still's artwork, and in the larger context of art history. In these demonstrations (which I photographed at the Clyfford Still Museum), you can see that while elements of abstract art are often derived originally from figures, landscapes and more traditional still life subjects, in their final form the compositions may be openly interpreted by those who experience the art. It is this idea of artistic interpretation that most excited me about photographing Valerie in this space. As I moved around the space with my camera, watching her move, I asked simply, "what do you see?" and directed very minimally, only reacting for compositional or framing purposes. Together we moved through the museum, creating and capturing, from painting to painting. My perspective kept switching from the physical space and relationships between gallery, painting and dancer, to the framed composition within a photograph. During my years as an architectural photographer, this interplay between three dimensional design and two dimensional photography always excited me, but the opportunity to play with these parameters -- now with a moving dancer -- was creatively satisfying on a whole new level. My heart leapt right with Valerie's movements as I watched her improvised choreography transform the artwork before my eyes. 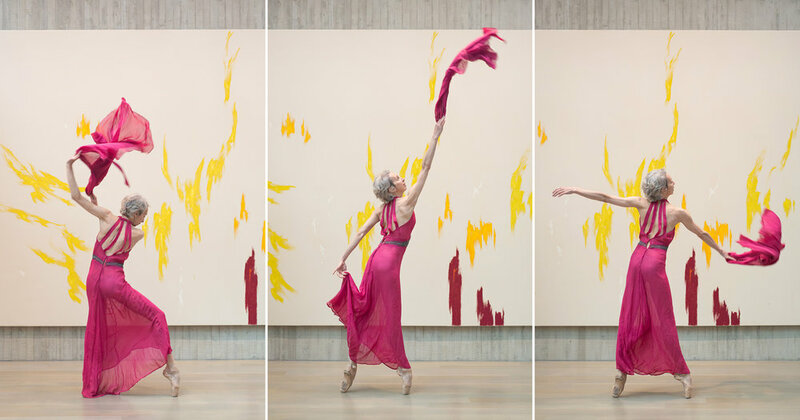 Paintings came alive in ways I hadn't previously perceived as she danced with them. Sometimes in quiet contemplation. Other times it was as if she leapt right into the compositions and became a part of the paintings themselves. In this block of creative, "art for art's sake" time we were transported into a world of imagination, color, movement and the beauty of dance. A world of where dance choreography meets improvisation. This is a world where three dimensional space can flatten into a framed composition in a celebration of the human body and art -- where photography allows something frozen in time to remain full of life. ABOUT VALERIE MADONIA (DANCER): Valerie Madonia began her dance training with Maris Battaglia at the American Academy of Ballet in Buffalo, NY and left home at the age of 14 to continued at the National Ballet School of Canada, graduating in 1979. She was a recipient of the prestigious Peter Dwyer Award for Dance Excellence. She danced professionally with the National Ballet of Canada 1979-1981 (under the direction of Alexander Grant), at American Ballet Theatre 1981-1986 (under Mikhail Baryshnikov) and at the Joffrey Ballet 1987- 1997 (under Robert Joffrey and Gerald Arpino). Ms. Madonia began as a member of the corps de ballet eventually establishing herself as a leading ballerina with the Joffrey Ballet. She had the honor of dancing as a company member with Alonzo Kings Lines Ballet, Armitage Gone! Dance, Complexions Dance, Configuration Ballet and as a guest artist with Alaska Dance Theatre, Russian Ballet Theatre, Lemon Sponge Cake Contemporary Ballet, and at Le Gala des Etoiles numerous times in Montreal and Greece. She performed the role of the Princess in Stravinsky's L'Histoire du Soldat at the Santa Fe Chamber Music Festival in 2001 and with the New York Philharmonic in 2005, conducted by Alan Gilbert and accompanied by Pinkus Zuckerman. Madonia appeared in six PBS Dance in America Specials and is featured in four dance books, most prominently in, Classical Ballet Technique, by G.W. Warren. She performed the role of Madge in Colorado Ballet’s 2015 production of La Sylphide and as the Queen in it’s 2017 Swan Lake. Her choreographic credits include the full length Ballets: Cinderella for Louisiana Delta Ballet, The Nutcracker, Polar Express and Appalachian Spring for Telluride Dance Academy and Ames Conservatory, Shapeshift for Boulder Ballet in addition to new works for the NYC Dance Now Festival, Sunday Salons and Les Patineurs for Colorado Ballet’s Pre -professional Division, Solo works for professional dancers in Colorado Ballet, YAGP competitions, Ballet West and Dayton Ballet. In 2016 she staged staged Gerald Arpino’s Light Rain Pas de Deux for Colorado Ballet. ABOUT JENNIFER (PHOTOGRAPHER): After a ten year career as an architect, Jennifer is currently an Award Winning, Denver based photographer, specializing in actor headshots and high school senior portraits. She is also an accomplished theatre and dance production photographer, having worked with the Colorado Shakespeare Festival, the Denver Center Theatre Company and Denver School of the Arts. She specializes in creating a positive experience and helping clients find their value through photography, fostering a sense of connection in her work, and bringing out personality in her clients while celebrating THEIR work. Her published theatrical photography work has run all around the world, and has appeared in American Theatre Magazine, The New York Times, Playbill.com, Broadway World and the Denver Post, to name a few. FINALLY: A special thanks to the wonderful staff and curators at the Clyfford Still Museum for a lovely experience. I highly recommend a visit to this unique museum in the heart of Denver's growing arts district. Photographers, please note that a photography permit is required in advance to photograph subjects in this space.